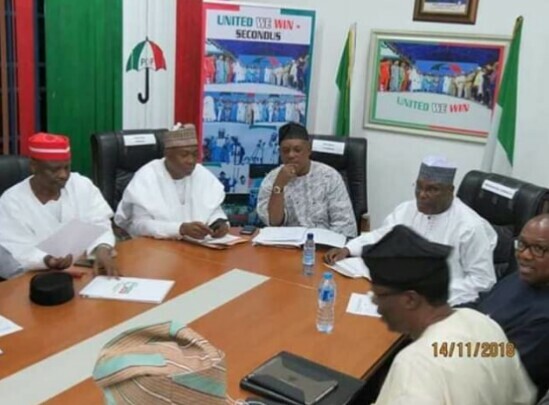 The meeting was the first Atiku held with the members of the campaign council since they were named a few days after the former Vice-President won the party’s presidential nomination. Those who attended the meeting included the National Chairman of the party, Prince Uche Secondus; Director-General of the PDP Presidential Campaign Council, who is also the President of the Senate, Bukola Saraki; the Governor of Sokoto State, Aminu Tambuwal, who is the zonal coordinator of the campaign for North-West; Governor of Gombe State, Ibrahim Dankwambo, zonal coordinator, North-East; Governor of Benue State, Samuel Ortom, zonal coordinator, North-Central; Governor of Rivers State, Mr. Nyesom Wike, zonal coordinator, South- South; and a former Governor of Ekiti State, Mr. Ayodele Fayose, who is the zonal coordinator for the South-West. Others were the Governor of Ebonyi State, Dave Umahi, zonal coordinator, South-East; a former Minister of Special Duties and Inter Governmental Relations, Kabiru Turaki, Chairman, Legal Matters; and Governor of Akwa Ibom State, Emmanuel Udom, who is the Chairman, Fund Raising Committee.